Tous le Jours Bakery, Beaverton, OR. How does Tous le Jours stand up to Oyatsupan? Not long after I rediscovered Oyatsupan Japanese Bakers in Beaverton, I happened upon Tous les Jours Bakery which recently opened in central Beaverton. 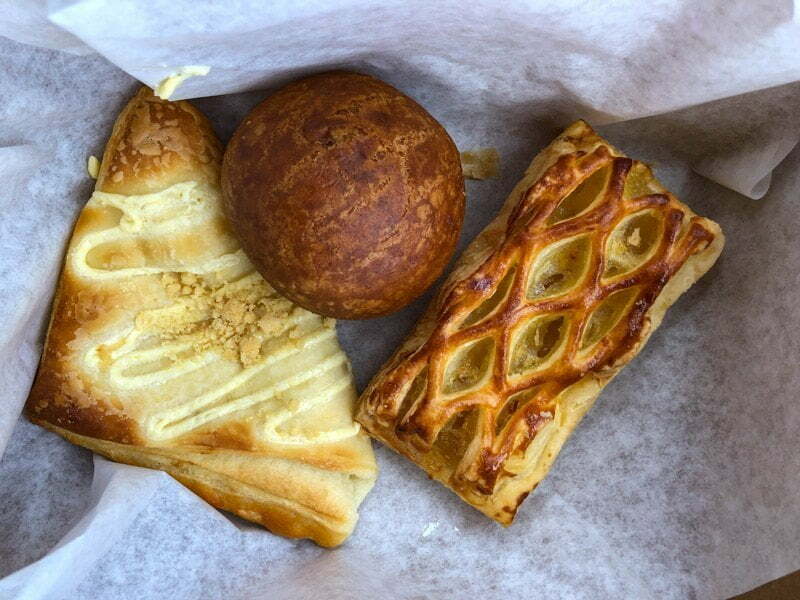 It too is an Asian bakery, this time “French-Asian inspired baked goods”. I’d never heard of the chain before and wondered if it would be a better, closer-in option to Oyatsupan. 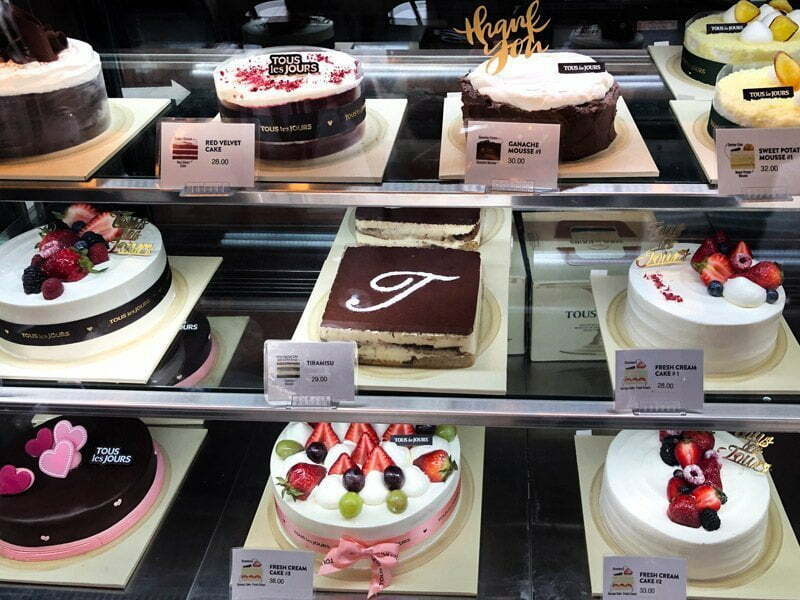 Tous les Jours is a large Korean chain – 50 stores in the U.S. and more than 1,500 around the world. Prior to this opening, the closest branch to Portland was in Bellevue Washington. The interior has the corporate feel, more akin to a Starbucks than a bakery; functional and well lighted but not particularly homey. The corporate logo is projected onto the wall, lots of tables are shoe-horned into a small space, and the happy crowd frequently overflows available seating. 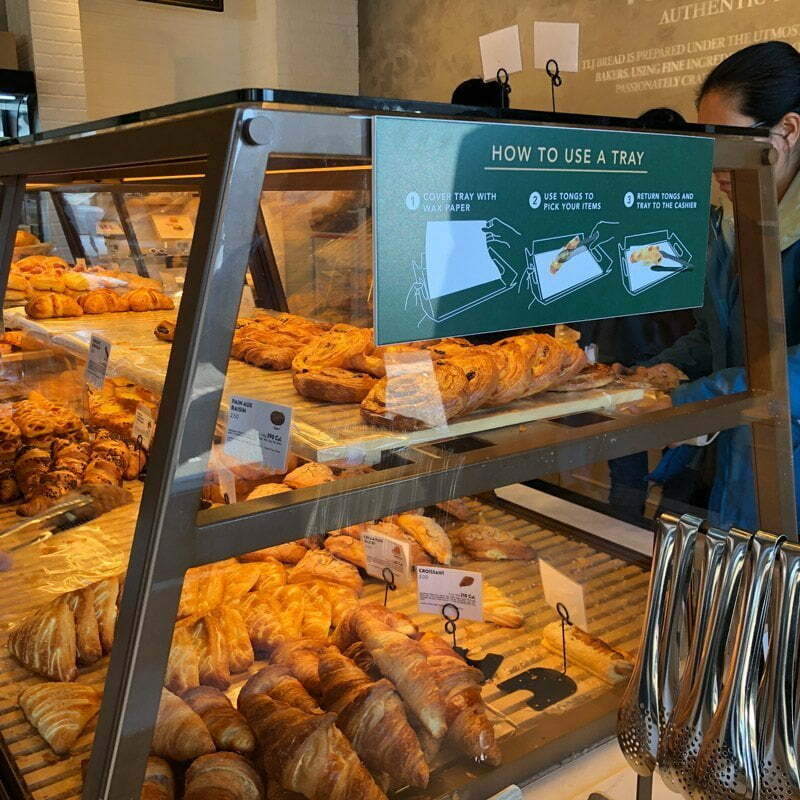 Like Oyatsupan there are large display cases with the latest goods – grab a tray and tongs at the door and make your way through the pastry cases, picking out what you want. Some items are merely put into individual cellophane bags and placed on shelves, and cakes are placed in a cold case next to the register. The staff is efficient and happy to answer questions. When the bakery opened they frequently ran out of many items by early afternoon, but now they have geared up enough to have baked goods available all day. Though pastry is made in the kitchen on premises, there is no mention anywhere of local/sustainable/organic ingredients, just “We promise our customers to offer quality products made with fresh ingredients”. In the big picture, the space doesn’t matter all that much; it’s about the food. Having just finished a review of the similar Oyatsupan, I set out to compare the two, taking items from both bakeries home to compare them next to each other. My preference skewed towards Oyatsupan in every category from the bread to fillings and selection. I’ve had a wide variety of items from Tous les Jours. Overall the baked goods have a mass-produced feel to them. The bread lacks spark and any meaningful flavor, puff pastry is not particularly crunchy or memorable, and the fillings, while competent are no more than that. The apple hand pie has a soft and light but otherwise forgettable crust, though the apples inside are crisp and flavorful. A red bean bun was fine, but the red bean didn’t compare to the other Asian bakery, sweeter and more grainy with less depth of flavor. The women in front of me must have bought six sweet rice balls but they tasted a bit off to me like the oil had been used a bit too many times which left a greasy, gluey feel. The custard bun fared better with clean tasting slightly sweet bread, but the vanilla was a bit weak. The cream puff pastry reminded me of the frozen Pillsbury turnovers I grew up with – flat, lifeless dough. One thing that bugged me on every visit, although it seems to be getting better, is the way the milk bread stuck to the roof of my mouth. I think it comes back to the structure, and I found it off-putting. 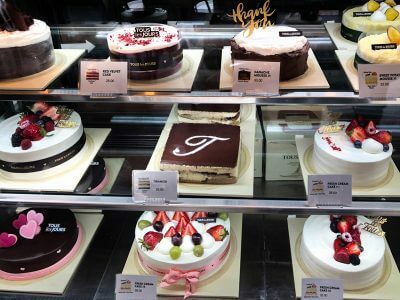 An array of cakes which I haven’t tried are available with selections like fresh cream cake, chocolate buttercream, tiramisu and red velvet, ranging from $28 – $32.00. I have thought about adding a rating to bakery reviews called, “Is it as good as it looks?” I believe in all things in moderation, and when going to bakeries the question I consider is, “Is this worth the calories?” Unfortunately, many bakeries fail to meet these qualifications, and though they’ll do in a pinch, Tour le Jours falls short too. The biggest positive is the prices – here similar items are at least 1/3rd lower than Oyatsupan. Rating: Ratings over four visits: Consistency 100%. Quality C. Atmosphere: B. Address: 11735 SW Beaverton Hillsdale Hwy, Beaverton, OR 97005 Map (near Penzys Spices and Trader Joes). 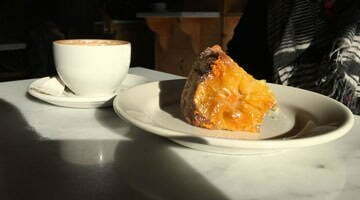 Category: Bakeries, Portland Restaurant Reviews. 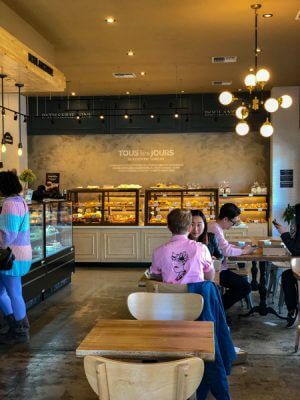 Related posts about Tous le Jours Bakery.